Pernice Brothers is an indie pop group based in Massachusetts, USA. 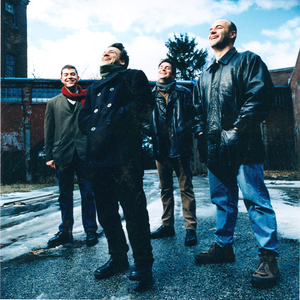 The band was formed in 1997 by Joe Pernice. Massachusetts-born Pernice had begun his recording career in the country-rock Scud Mountain Boys. He left the band, and most of its country music trappings, to pursue pure pop. The Pernice Brothers also included Joe's brother Bob Pernice on guitar (hence the name), Peyton Pinkerton (guitar), Mike Deming (piano), bassist Thom Monahan, and Aaron Sperske on drums. Massachusetts-born Pernice had begun his recording career in the country-rock Scud Mountain Boys. He left the band, and most of its country music trappings, to pursue pure pop. The Pernice Brothers also included Joe's brother Bob Pernice on guitar (hence the name), Peyton Pinkerton (guitar), Mike Deming (piano), bassist Thom Monahan, and Aaron Sperske on drums. The band's first release was 1998's Overcome By Happiness. They have since recorded four more studio albums: The World Won't End (2001); Yours, Mine & Ours (2003), Discover A Lovelier You (2005), and Live A Little (2006). They released a live album, Nobody's Watching/Nobody's Listening in 2004. Pernice has also made two solo outings, one under the name Chappaquiddick Skyline. Their music is distinguished by Pernice's silky, breathy vocals, reminiscent of Colin Blunstone or Nick Drake. He cites many musical influences: Frank Sinatra and Sammy Davis Jr, as well as Jimmy Webb, The Carpenters, and The Bee Gees. The deceptive simplicity, seductive melodies and soaring choruses of his songs also attract comparisons with the Beach Boys, Big Star, The Hollies and The Zombies. Yet the band can as easily sound like The Cure or New Order. Pernice is also a fine lyricist (he has a master's degree in creative writing). His songwords show that Pernice can not only tackle difficult and offbeat subjects, but that he has a Morrissey-esque dark sense of humour too.